Samsung have unveiled the Galaxy A70, the newest smartphone in the popular Galaxy A range. This new mid-range smartphone showcases a stylish design, large infinity display, enhanced triple camera, powerful battery and seamless connectivity. The Samsung Galaxy A70 will be available in the UK from 26th April priced at £369. 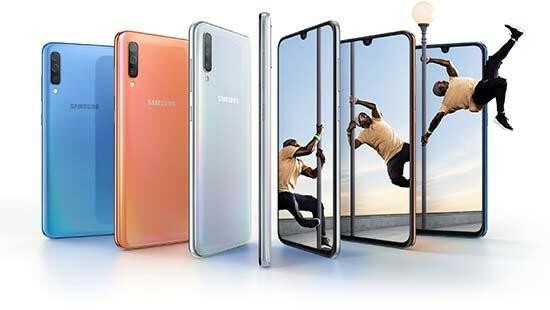 LONDON, UK – March 26, 2019 – Samsung Electronics Co., Ltd. today unveiled the Galaxy A70, the newest smartphone in the popular Galaxy A range. Built with Samsung’s latest innovations and upgraded essential features, the Galaxy A70 showcases a stylish design, large infinity display, enhanced triple camera, powerful battery and seamless connectivity. This smartphone is designed for digital natives who want to capture, connect and share life as it happens. Available in four distinctive colours including Coral – this year’s on-trend colour– Blue, Black and White, the Galaxy A70 features a stylish prism effect that reveals stunning gradient colours depending on light direction and reflections. Make the most of your snaps with the Galaxy A70’s Scene Optimiser that can recognise and intuitively enhance up to 20 scenes, bringing out the best in what it sees. And with Flaw Detection that automatically identifies glitches before you click, you’ll never miss the perfect shot. The Galaxy A70 comes with a powerful 4,500 mAH battery, giving you the freedom and convenience to share and stream. With Super-Fast Charging at 25W, you can be back in the action faster when you need a battery boost. The Galaxy A70 will be available in the UK from 26th April, RRP £369. Stay tuned for more information on the Galaxy A that will be revealed at ‘A Galaxy Event’ – taking place across three different continents on 10th April.